Despite chilly temperatures and a mist in the air, Tulsa's 18th & Boston neighborhood was alive and rocking as 50+ musicians graced three stages during Tom Skinner's Skyline Music Festival. A total of $6,871 was raised to provide grants to Oklahoma musicians in crisis through the Red Dirt Relief Fund. A raucous crowd responding with "Saved" as John Fullbright ended his headlining set at The Shrine with featured friends Jacob Tovar, Wink Burcham, Jesse Aycock, Roger Ray, Stephen Lee, Paul Wilkes and Jake Lynn. A packed house at Mercury Lounge for Scott Evans, Mike McClure and Paul Benjaman who all shared the stage with Tom Skinner during this lifetime. 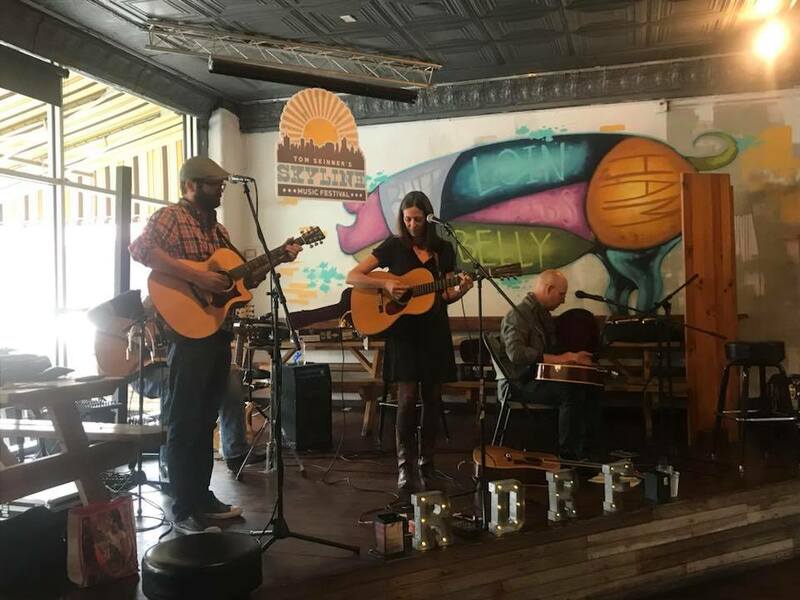 A delicious Burn Co. brunch kicked off with beautiful gospel harmonies by Monica Taylor, Gabe Marshall (of The Damn Quails) and Jared Tyler. Tulsa Health Department and Dr. Joanna Roulston of Tulsa Dental Center delivering free flu shots, dental and health screenings to musicians in the greenroom at Burn Co.
All of the above was included in the e-mail send out by Red Dirt Relief Fund a few days after the event. The 3rd Annual Tom Skinner Skyline Festival was definitely a day of music family and love, and I’m so thankful to get to be a part of this amazing scene and all that it has to offer. I had the privilege and pleasure of joining Jeremy Skinner and his son Flash for brunch before the event. This is of course Tom’s son and grandson. The brunch was hosted by RDRF and Burn’s BBQ to help raise money for the day as well. The food was delicious, the music was awesome, and the mimosas were lovely. After brunch there was an hour or so of downtime before the music kicked off, but there were still plenty of people hanging out and enjoying each other’s company until then. Bekah’s Inappropriate Trucker Hats was on hand with her delightful array of belly busting hats. Her great big smile and delightful personality always makes my day, and her hats might be the funniest damn things around. Seriously, look her up. I got to love on Brandon Jenkins’ momma and hug her neck, which is always a good thing. She showed off her awesome new tattoo, that she got for her 70th birthday. Which I personally think it amazing in so many different ways. The silent auction was full of great items, and the musical line up all day long on both stages was nothing short of magical. I’m not sure I have enough words to even describe what a treasure our Okie musicians, and organizations like RDRF are, not to mention the love that was felt as we all came together to honor the life and legacy of Tom. So I’m going to just let the pictures show you instead.